NOTE: Only USTFCCCA member programs are eligible for rankings. Please check your membership status HERE. 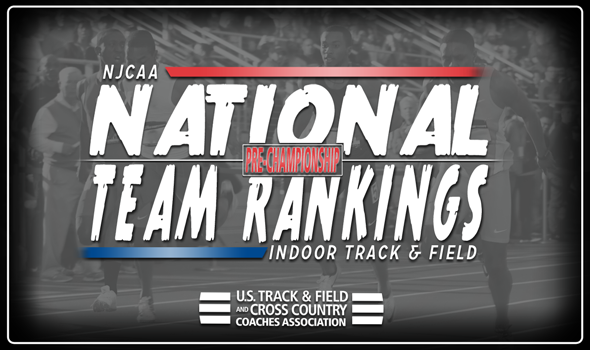 NEW ORLEANS – There are only four days until the NJCAA Indoor Track & Field National Championships, and there is a new team to beat on the men’s side of the National Team Rankings. South Plains (Texas) and Barton (Kan.) CC swapped spots in the rankings, with the Texans jumping up to first for the first time this season. While the men’s rankings had the aforementioned interesting development take place, the top-11 spots in the women’s rankings went unchanged from a week ago. While the action on the track was pretty quiet across the penultimate weekend of NJCAA indoor track & field, that didn’t stop South Plains (Texas) from taking over the top spot in the rankings. The Texans have a whopping 18 top-10 Descending Order List marks this year, including five in the top-three. This might bode well for South Plains (Texas), who won the national title the last time they were ranked this late in the season, coming during the 2015 campaign. They will look to dethrone the Tritons, which have won the last two championships. However, below both the Texans and the Cougars of Barton (Kan.) CC, the third and fourth spots remained the same as Iowa Central CC and Cloud County (Kan.) CC held down the fort in those two spots, respectively. Barton (Kan.) CC is tied for the most top-10 Descending Order List performances with Cloud County (Kan.) CC with 19. Iowa Central CC owns 17. Western Texas made its first appearance in the top-five on the season, coming in at fifth. The Westerners were last in the top-five of the rankings during the fifth week of the 2015 season. The women’s NJCAA rankings went virtually unscathed over the week. Iowa Central CC, New Mexico JC, Central Arizona, South Plains (Texas) and Barton (Kan.) CC all stayed in the top-five spots, respectively. The Tritons managed to successfully hold onto the top ranking throughout the entire season. The other four teams have jockeyed for spots two through four since the third week of the season. This isn’t uncharted territory for any of these programs, as New Mexico JC, Iowa Central CC and Central Arizona have won the last three national titles, respectively. Iowa Central CC leads the pack with 26 top-10 Descending Order List marks, including an NJCAA-leading 14 in the top-three. The Thunderbirds own 24 top-10 marks, while South Plains (Texas) sits in third with 18. Central Arizona and Barton (Kan.) CC have 16 apiece. The first change in the women’s rankings came in at 12th, where Hutchinson (Kan.) CC moved up two spots.